The three of swords is the card that makes my heart sink more than any other when it comes up in a reading - and I use those words deliberately because the card does indeed show a pierced heart in a deluge of rain. Although it is only one of the minor arcana, I fear it more than any of the other supposedly scary cards – more than Death, the Devil or the Tower. It is the card of heartbreak – which is why I’m blogging about it on Friday 13 February, the day before Valentine’s Day and a day associated with back luck. The traditional image of the three of swords comes from the Rider Waite deck - that’s the card second from the right in the photo at the top. To me that depicts exactly the way it feels when love ends tragically - it can seem as though there is nothing left in the world but tears and pain. It is a negative card – generally considered one of the most negative in the entire tarot deck – but if you bear with me I will show why there is always hope and something positive that can be found even in this card of despair. First I am going to discuss meanings give to the three of swords in a few different decks. I’ll start with the Rider-Waite, which defines the three of swords as: “Removal, absence, delay, division, rupture, dispersion, and all that the design signifies...” That’s the grim, traditional definition for the three of swords - but to really understand the card and learn the lessons it teaches, or to help someone you have done a reading for who is feeling all that anguish, you need to look a little further. However, it goes on to show the way out of this situation: “Feel your emotions, express them fully, then let go.” When you feel really upset, it is not only OK to cry, it is therapeutic. Most of us will at some time or other experience heartbreak in our lives, whether that is because of a lover’s betrayal, the break-up of a relationship, a forced parting or ending, or even a death. No one wants to feel the pain of that loss, but sometimes it is unavoidable. At first, you really do need to let your feelings out – probably by crying. But the suit of swords (or arrows or feathers) is mainly about thoughts rather than emotions (the suit of cups is more focused on feelings). Those swords – or arrows – are your own thoughts that are stabbing at you with regrets and recriminations – and you need to look at them carefully. The Animal Wisdom Tarot says: “Look to the heart of the matter to identify painful patterns in your life. Move beyond pretence.” The Wildwood Tarot offers the advice of learning to accept and forgive, even if life isn’t always fair. The Lover’s Path Tarot also shows the way to move on from the sorrow: “The need to transform grief into understanding.” It explains that sorrow can be part of the path to enlightenment. The final card I photographed (right) is from The Guardian Angel Tarot, which neatly renames the suit “Thought”. The Guardian Angel Tarot is specifically intended to give gentle answers. It interprets the traditional cards in the least scary way possible, without actually losing their meaning. The three of thought doesn’t show any pierced hearts or storms of tears – instead it shows an angel. The definition states: “Loving angels surround you to heal and comfort you. The sadness you feel will fade with time.” That last part is true for all readings in which the three of swords, arrows, feathers or thought comes up. Time really is a great healer. The first part – the bit about angels – might be easy to scoff at if you don’t believe in angels. 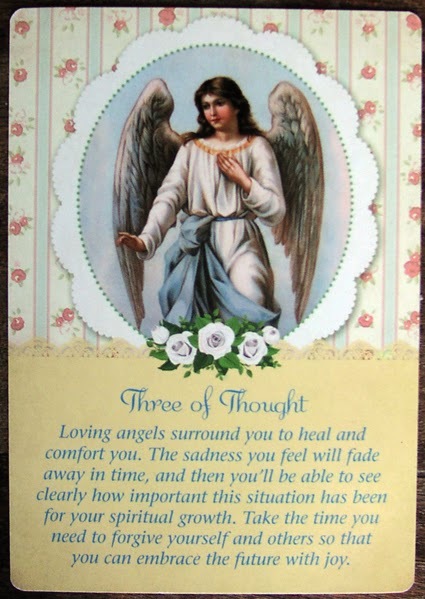 But I don’t think you need to have faith in literal angels to get comfort from that card. Most of us will have someone we can turn to in times of need – friends or family members who we can get in contact with and who will be a shoulder to cry on. Even if we feel we are all alone in the world, without a single friend, there are still helplines that can be called. For example, the charity Relate has counsellors available to chat to by phone or email about relationship issues. The Samaritans also offers confidential emotional support for those who are experiencing despair. If you are suffering the heartbreak shown on the three of swords remember, you are not alone unless you choose to be, it is OK to cry, these feelings will pass, learn from this situation and move on. Another day – perhaps as soon as tomorrow – you will find happiness again.